NURTuRE (the National Unified Renal Translational Research Enterprise) is the first and unique kidney biobank for chronic kidney disease (CKD) and idiopathic nephrotic syndrome (INS), covering England, Scotland and Wales. Biological samples (plasma, serum, urine, DNA and tissue) from 3,000 patients with chronic kidney disease (CKD) and over 800 patients with idiopathic nephrotic syndrome (INS) from 14 NHS Trusts are being collected and stored* under strict Standard Operating Procedures for both academic and industrial research worldwide. This biorepository also has the considerable advantage of containing anonymised linked clinical data, through the UK Renal Registry, which will enable us to develop new biomarkers. This will then lead to a greater ability to identify patients who will benefit from better, earlier diagnosis and person-specific new treatments, leading to better health outcomes. 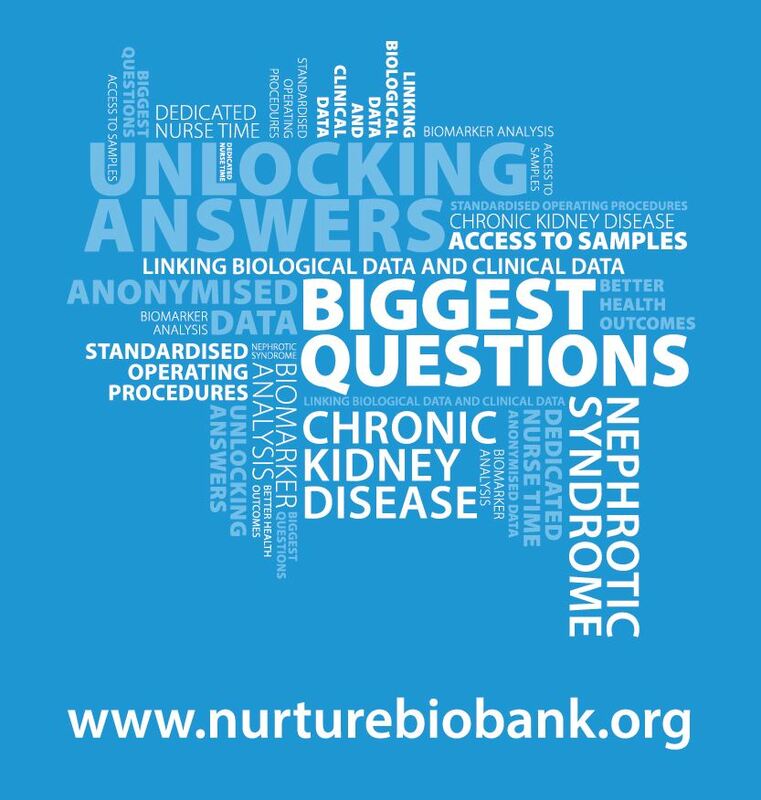 “The anonymised data contained within the NURTuRE biobank has the potential to unlock answers to some of the biggest questions about CKD and NS,” says Elaine Davies, Director of Research Operations at Kidney Research UK. NURTuRE is a research collaboration involving a charity, academia and industry, under the strategic oversight and management of Kidney Research UK. The project is being jointly delivered through the University of Bristol, led by Professor Moin Saleem, Professor of Paediatric Renal Medicine, supported by Liz Colby as co-ordinator for the NURTuRE-INS (NephroS) study; and the University of Nottingham, led by Professor Maarten Taal, Professor of Medicine, supported by Fiona Robertson, co-ordinator of the NURTuRE-CKD study. “I’m excited to be part of NURTuRE, which will hopefully bring about real change for patients with CKD and NS, leaving a legacy for them and researchers for many years to come,” says Fiona. “It’s great to work on NURTuRE, creating a powerful resource which has enormous potential to improve treatments for kidney patients,” says Liz. The biobank is funded by AbbVie Inc, Evotec AV, Retrophin, UCB Celltech Biopharma and Kidney Research UK. Patient groups (in particular, the Nephrotic Syndrome Trust and Kidney Research UK’s Lay Advisory Committee) have been involved at all stages in the development of NURTuRE. Patients have also had direct input into the study documentation, including the patient information sheets and consent forms. The NURTuRE collaborators will have access to the samples and associated data when they are available. From early-2019, other investigators and pharmaceutical companies will be able to apply to an independent access committee to use stored biosamples and data for future studies. If this is of interest to you, please contact: nurturebiobank@kidneyresearchuk.org in the first instance with details of your request. For general information about the NURTuRE biobank please contact: nurturebiobank@kidneyresearchuk.org or see the ‘Contacts’ page. If you are patient interested in getting involved, see the ‘Patients’ page. * Biofluid samples are stored at the UK National Biobank in Milton Keynes and biopsy material at the Clinical Research Facility (CRF) at the Queen Elizabeth Hospital, Birmingham. Biomarker analysis will take place at the University of Geneva and histopathological (tissue) analysis at the University of Birmingham.